Successfully Added KS1 Android TV Media Player + Soundbar - 4K Resolution, Android 5.1 Wi-Fi, Bluetooth, Preinstalled KODI 16.0 (Gold) to your Shopping Cart. Upgrade your TV with a powerful media device — the 4K KS1 Android TV box, sporting built-in speakers and DVB-T2 support. Bring the convenience and functionality of Android interface right to your big screen with the KS1 TV box. Get more out of your TV screen with loads of apps from the Play Store, easy navigation and lots of operating system upgrades like Screen Pinning. With the KS1 TV box, you will be able to watch all your favorite games, movies and TV shows in great 4Kx2K quality. Moreover, you will have 2.5 inch speakers built-in for great sound quality and a totally immersive experience. The powerful Amlogic S905 Quad-core 64-bit processor will back up all your multitasking and media play and Mali-450 GPU will ensure smooth gaming. With DVB-T2 support, comes even more functionality. It lets you access digital broadcast transmissions that are used by today’s cable companies and you will get access to the content from your local and national TV channels. .
Kodi version 16.0 preinstalled is an added bonus that gives you loads of free content, easily available online from Kodi repositories. You will have 8GB of internal storage to keep all your downloads and 32GB more on an SD card. Lots of sharing options are available: Micarast, DLNA and Airplay. With Bluetooth and Wi-Fi support, the TV box comes with great connectivity and will easily communicate with other devices. 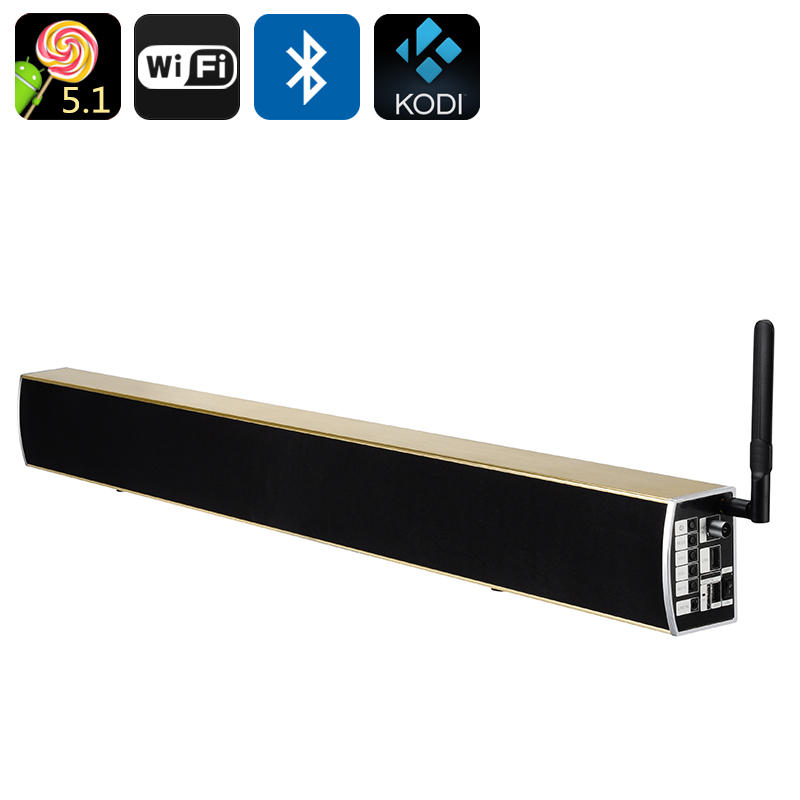 The KS1 Android TV Box + Soundbar comes with a 12 months warranty, brought to you by the leader in electronic devices as well as wholesale Android TV boxes..